Port-A-Poo was born out of necessity. My husband and I have eight dogs (check out "Our Story" for the details) and they generate a lot of poop. We love taking them for a walk but cleaning up after all eight was tough; having to carry the poop bags with each of us holdiing four leashes was even more difficult - bordering pretty much on just plain gross. We went to the drawing board and after much experimentation came up with Port-a-Poo. Made of durable plastic, it reliably provides a simple hands free way to carry poop bags. It attaches to virtually any leash and with just a flick of a finger the latch opens and closes around the poop bag. Each prototype was rigourously tested on our pack of eight and continuously improved until we were completely satisfied. Whether you have one, three or eight dogs, Port-a-Poo will enhance your dog walking experience. You will enjoy a hands-free sanitary walk each and every time. Don't be left holding the bag - let Port-a-Poo, your leash and your dog carry the poop for you! Hi, my name is Madison. I was Mommy's first puppy. I used to be an only puppy, so I was kind of spoiled. I have to admit (please don't tell Mommy) that it did get kinda lonely at times, so I was glad when Zoe moved in to keep me company. I was just sort of used to sharing some of my stuff with Zoe when things really got goofy - when Mommy married Daddy. Daddy had two puppies as well, so now I had to also share my things, Mommy and Daddy too, with Molly and Sampson. I was not a happy puppy! If it had stopped there it might have been ok, but the craziness wasn't close to being over . Did I mention that Mommy and Daddy love dogs? 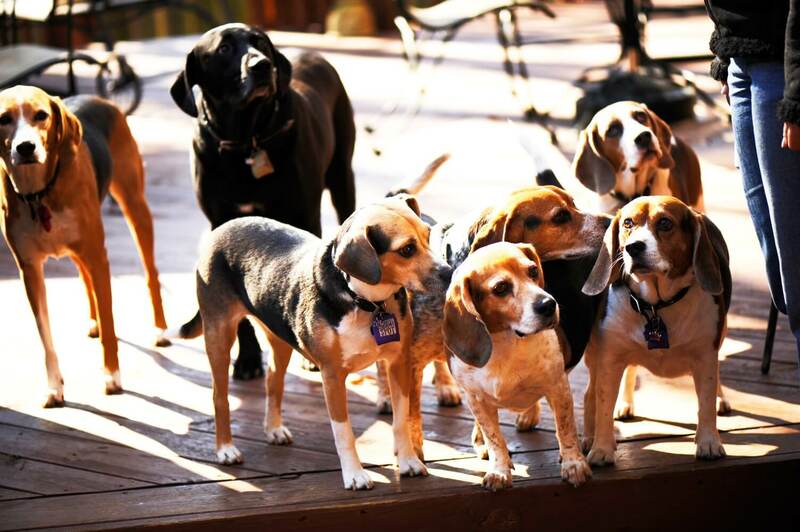 They love all dogs, especially beagles (it should be obvious why, because we are naturally the best). 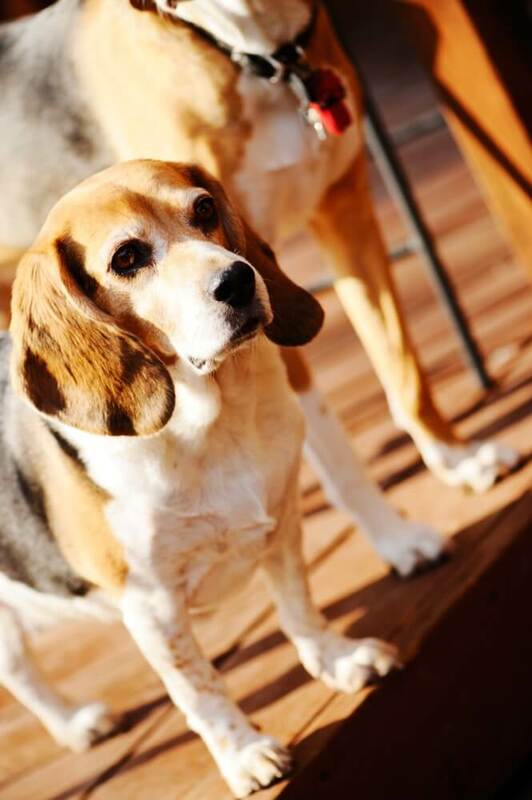 When Mommy joined a beagle rescue I really got worried 'cause I knew what was coming. Yep, just as you might have guessed, Mommy was such a wuss that she couldn't stand to see a beagle suffer, so she brought home Chester, and then Lauren, and then Sassy. Just when I thought the torture was over she brought home George! Now I share my home, all my toys, and my Mommy and Daddy with SEVEN "brothers and sisters". My Mommy and Daddy are the absolute best! Did I tell you that most of us in my pack are rescue dogs? Although there are a bunch of us, I receive all the love I need and so do my brothers and sisters. No one takes care of a puppy better then they do. Now while I love all my brothers and sisters, when Mommy brought home George I finally had to put my paw down and tell Mommy that if she brings home one more puppy "I'm outta here". About then Mommy had a great idea for the Port-A-Poo product. I suggested that instead of rescuing any more puppies, she donate a portion of the profits to a doggie charity or rescue organization. I even suggested she tailor the donation to the charity in a way that will maximize the benefit to other puppies. I guess I still have a say in how to run the house, because she and Daddy quickly agreed! It was nice chatting with ya, I hope you have a better idea now about how great my "family" is. All through our web site you will find pictures of me and all my brothers and sisters. You might even see a couple of my Mommy, Daddy and two-legged sister in here as well. Thank you for visiting our site and please buy lots and lots of Port-A-Poos so my Mommy won't bring home any new puppy surprises! Your shopping bag is empty, why not add a few Port-A-Poos?